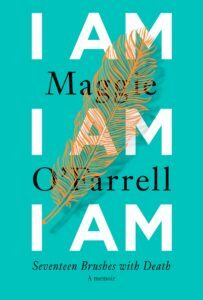 I Am, I Am, I Am by Maggie O’Farrell is an exquisite collection of essays about 17 brushes with death by the Irish author Maggie O’Farrell. From the medical – a c-section gone wrong, a brain infection – to near-drownings while on vacation and narrowly escaped violence at the hands of others, O’Farrell has faced a lot of physical adversity and danger over the course of her life. A life lived on the razor edge of death made O’Farrell less, rather than more, risk-adverse, pushing her to embrace mortality, almost daring it to stop her as she sought out adventures and experiences, often ill-advised, that her body may not have been able to handle. Some chapters are more successful than others; the chapter about an AIDS test ends rather vaguely, for example, and detracts slightly from the overall collection. But there are others in which danger is so clearly present that I found myself rattled and anxious, even knowing, of course, that O’Farrell is alive and well. How frequently have we all been in situations where our safety was in grave danger, most likely without even knowing it? Life is a daily, ongoing miracle that we so often take for granted and think about only fleetingly, yet many of us could likely fill 17 chapters with our own harrowing brushes with disaster. I finished this book feeling grateful and lucky. I enjoyed I Am, I Am, I Am quite a bit as I read it, but my feelings about it changed when I got to the last chapter, which is about O’Farrell’s daughter. Without spoiling the book, it wasn’t until that last chapter, when risk and worry were upended and transposed, that I really understood why O’Farrell wrote it: her ever-present, unwavering and never lessening fear and vigilance caused by her daughter’s auto-immune disorder. As a parent, I found this chapter the most harrowing of all. I Am, I Am, I Am is definitely worth a read. If you’ve read any of O’Farrell’s novels (see here for reviews of Instructions For A Heatwave and The Vanishing Act Of Esme Lennox), then you know already what a beautiful writer she is. Her writing about her own personal experiences is even more meaningful and moving. I listened to I Am, I Am, I Am on audio. It was narrated by Daisy Donovan, who did a great job conveying the intensity of this personal narrative. (I was a little surprised that it wasn’t narrated by O’Farrell herself, and I supposed I just pretended it was O’Farrell reading it as I listened.) I highly recommend the audiobook, which breathlessly and urgently conveyed the gravity of the subject.